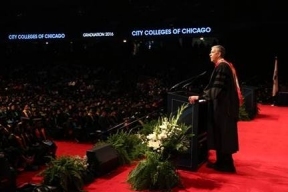 Graduates of City Colleges of Chicago are getting ready to head off to in-demand careers or transfer to four-year colleges after receiving their associate degrees April 30th at the 2016 City Colleges of Chicago commencement ceremony at the UIC Pavilion. 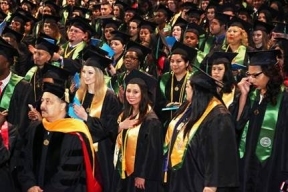 Former U.S. Secretary of Education Arne Duncan delivered the keynote address to the more than 1,800 graduates and 8,000 guests gathered for the occasion. Arne Duncan is currently Managing Partner at Emerson Collective– a philanthropic endeavor headed by Laurene Powell Jobs, the widow of Apple co-founder Steve Jobs. The 2016 Valedictorians met with Keynote Speaker Arne Duncan prior to the ceremony to discuss their career and educational goals.